There’s a lot of terminology and lingo when it comes to website design and online marketing. Software designers and engineers are geniuses at building accessible programs that allow for the ultimate optimization of your sales website, but because they are often essentially inventing something brand-new each time they put out a new product, they also get the chance to name everything. The result is a community that can sometimes seem to be simply speaking gibberish. By getting a grasp on a few of the most common terms, however, you can take a little mystery out of the Internet, and begin to understand just how website design, optimization and marketing techniques can help your business. Below, Emphasize Website Design of Calgary covers the first half of the alphabet with this sampling of need-to-know jargon from the website world. Accessibility: Just as it is in real life, accessibility is a practice in inclusion and refers to a site’s ability to be used by persons with diminished capabilities. A well-designed site should have text that can be enlarged, big and bright links for those who may not be able to handle a mouse as well as others, and if video is a priority on your website, consider adding closed-captioning. Back End: This is the part of your site where you or your marketing team go in to make changes, and is never seen by the public. Generally a back end is run by a Computer Management System (CMS), and often presents itself as a series of forms to be filled out. Bandwidth: The more bandwidth, the better! Bandwidth can be described in two ways: the rate at which data is transferred to your computer or, depending on your Internet contract, how much data can be transferred during a certain period of time before overages are applied. Browser: The programs you use to view the Internet, popular browsers include: Safari, Firefox, Google Chrome, Opera, and Internet Explorer. Cache: Cached files are pages that your browser has downloaded in order to open faster the next time you visit. These can pile up, so it’s a good idea to empty your cache every now and then to ensure everything runs as smoothly as possible. Cascading Style Sheets (CSSs): Rather than simply HTML, most websites are designed using a CSS system or a combination of the two. CSSs are essentially page templates that make it easier for the designer to keep things consistent, and can also simplify your site for better SEO performance as well as greatly improve its flexibility. Content Management System (CMS): A touch more sophisticated than CSSs, a CMS offers the user an approachable and responsive back end from which to run their site. Alterations should be easy with a comprehensive CMS! Domain: Basically the name of your website, a domain name usually incorporates the name of type of the business being represented and incorporates an extension such as .com, .net, .org, etc. Front End: The opposite of back end, the front end is everything the user can see and interact with on your site. HTML: Standing for Hypertext Markup Language, HTML is the language in which your website is written. HTML has gone through several versions since its first application, and is now in its fifth incarnation. 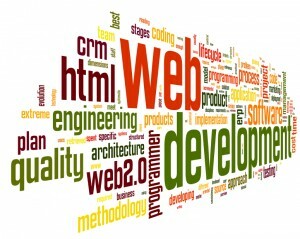 Find out more about the Development of Web Design. HTTP: Meaning Hypertext transfer protocol, HTTP is how the information from your website (written in HTML) is transferred from your server to your browser. Hyperlink: Hyperlinks, or links, get you from one page to another. They are the addresses to other locations on the Internet (either within your website or outside of it) that are provided somewhere on your pages. They are usually presented as a description of the content on the linked page that is highlighted with larger font, or is underlined, or is shown as a button, and their function is to make it easy for users to make their way around and find what they want. Landing Page: Often used for online marketing, Landing Pages are used to promote a special offer or to provide something of value to the user.